If the current is inverted on an LED, it becomes sensitive to light. In particular it is sensitive to the same colour of light it emits. You will find that the Light Sensor on the micro:bit is more reactive to red light than any other colour because that is the colour of light the display emits. On the micro:bit we have 6 analog pins, 3 are applicable to the display and reside on columns 1, 2 and 3. This means that we have 9 pins in total that we can sense light on if we are fast enough to transition between emitting and sensing light. The ADC takes around 4ms to settle and give accurate values with minimal current. This places restrictions on our sensing window. In the current implementation, the display and the Light sensor can operate in an interleaving manner. This interleaving is enabled due to a special display mode on the display which is automatically activated when readLightLevel is called by the user. This special mode (DISPLAY_MODE_BLACK_AND_WHITE_LIGHT_SENSE), increases the rate of the systemTick callback to 5ms, and the display is thusly configured to drop the 4th frame for user processing, which in this case, is entirely consumed by the light sensor. This reduces the display refresh rate from 55Hz to around 50Hz. This will trigger an event handler in the MicroBitLightSensor class. In the previous section we discussed how the display and the Light Sensor interleave. This section will cover the actual operation of the sensor during the MICROBIT_DISPLAY_EVT_LIGHT_SENSE event. 1) Disable the display so that the column pins are under the users' control. 3) Trigger the Light Sensor by firing a MicroBitEvent with the ID MICROBIT_ID_DISPLAY and the value MICROBIT_DISPLAY_EVT_LIGHT_SENSE. As we previously discussed there are 9 pins we can sense light on. However, we face the problem of interference from the state of other Columns. This reduces the resolution of our light sensing capabilities as we can now no longer can use 9 pins to sense light, purely due to the unfortunate fact that we obtain interference from other pins that cannot be mitigated. However, we do gain an accurate picture of the overall brightness detected by the display. We expose a mean representation of the light level from the 3 channels on the display. Set all rows to be a DigitalOut, with a value of 0. Set the current channel pin HI. Move onto the next channel. After these two phases have occurred, the display will now once again be available for regular usage until the next interleave is signaled by the display. Create a representation of the light sensor. The mapping information that relates pin inputs/outputs to physical screen coordinates. Defaults to microbitMatrixMap, defined in MicroBitMatrixMaps.h . map - The mapping information that relates pin inputs/outputs to physical screen coordinates. Defaults to microbitMatrixMap, defined in MicroBitMatrixMaps.h . This method returns a summed average of the three sections of the display. 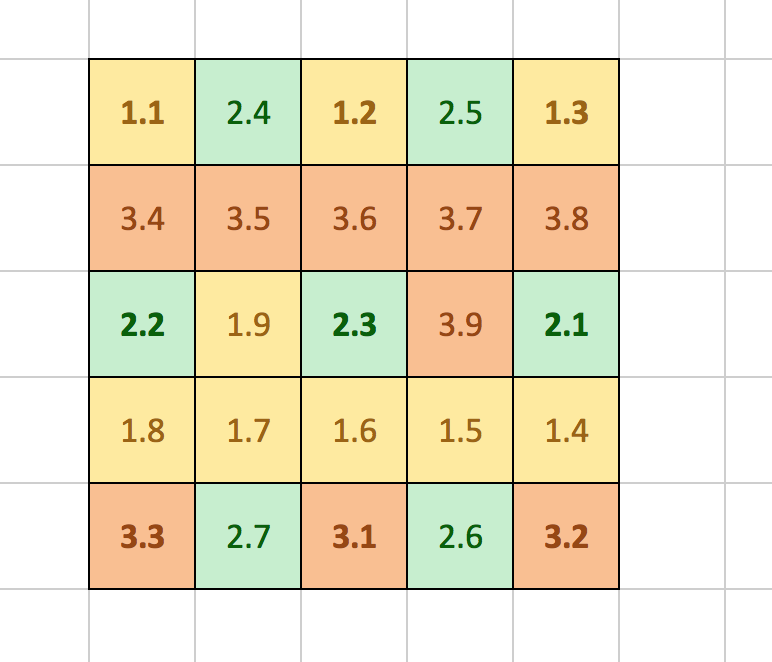 Where each number represents a different section on the 5 x 5 matrix display. The method that is invoked by sending MICROBIT_DISPLAY_EVT_LIGHT_SENSE using the id MICROBIT_ID_DISPLAY. this can be manually driven by calling this member function, with a MicroBitEvent using the CREATE_ONLY option of the MicroBitEvent constructor.